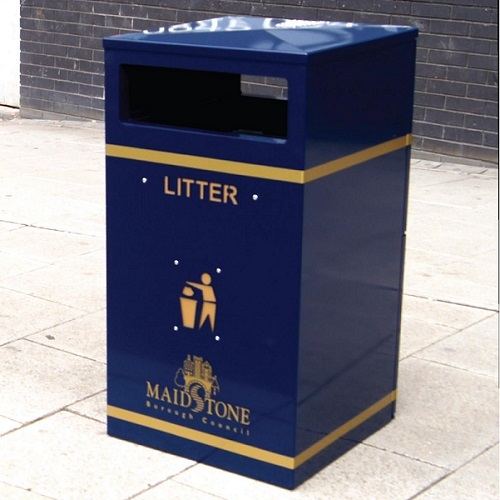 The Barnsley Mark 2 is an evolution of the Barnsley litter bin and is manufactured from 2mm galvanised steel and is a popular choice throughout the United Kingdom as it is a tough, durable and attractive litter bin. 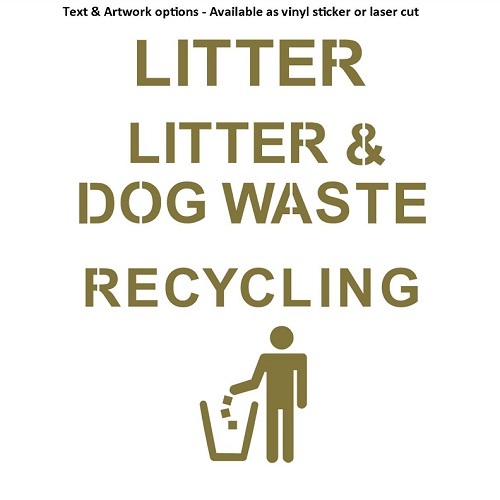 The bins have a smooth surface as standard and each bin is supplied with a vinyl word to both the front and back of the unit free of charge. Please select the text you require from the text and artwork option above. The option to upgrade to laser cut text is available and this includes either a gold or silver backing plate. The text is positioned underneath the apertures and is available in either English or Welsh. 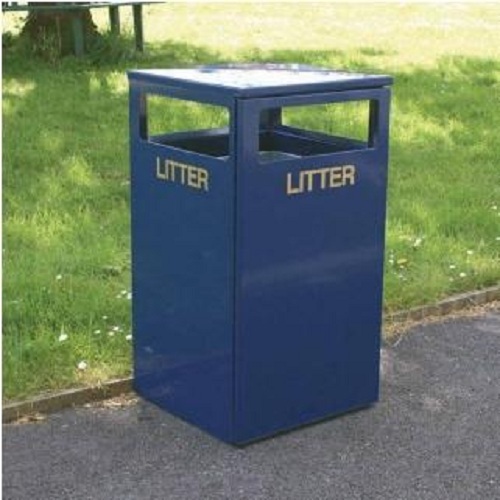 The bin features large pizza box sized apertures (Please note the image only shows two, however up to four can be specified) and a capacity of 112 litres makes the bin suitable for use in busy areas such as schools, colleges, universities, high streets, parks and green spaces. Internal litter deflectors ensure all rubbish goes inside the liner. An important feature of the Barnsley litter bin is the slam lock fitted to the door. This is a stainless steel lock which is easily opened with a square T key and closes with a push of the door against a spring loaded boss. 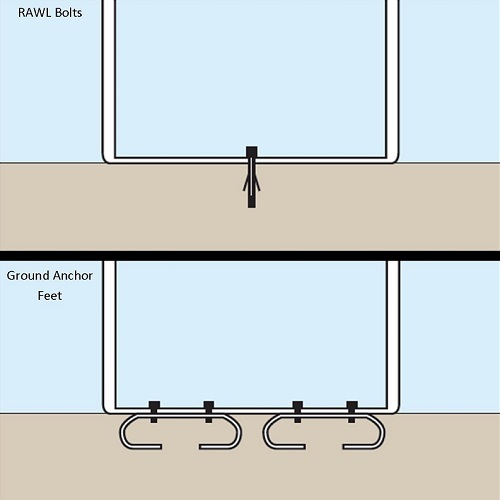 The door has a full 90 degrees opening and makes access and removal of the included galvanised steel liner mush easier. The hinge system is a full length pivoted steel rod and is very reliable even after thousands of openings and closures. 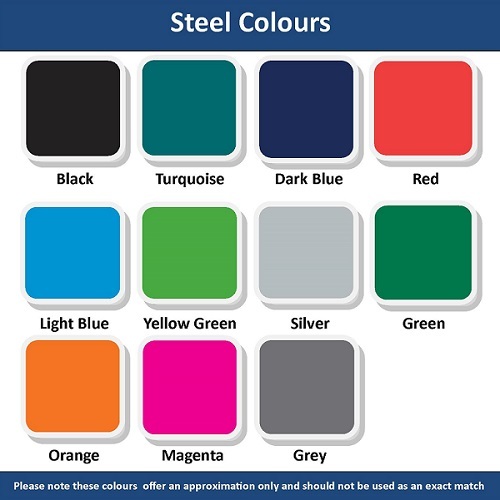 We offer the bins in an extensive range of RAL colours. Please see the colour chart image for reference. Please note that although every care has been taken to authenticate the colours, these offer an approximation only. We cannot be held responsible for the mismatch and accuracy of colours. 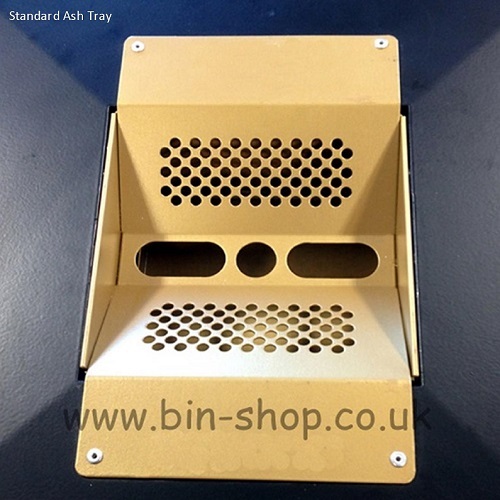 The bin is supplied with a pre-drilled base that allows it to be securely fixed to the ground using RAWL bolts. 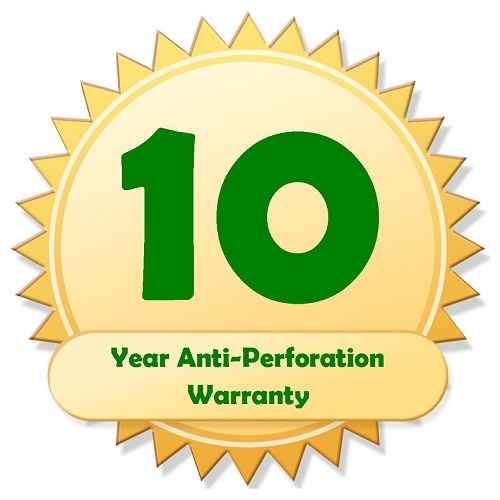 Alternatively ground anchor feet are available which allow you to site the bin in freshly laid concrete. The feet bolt to the bottom of the bin and once the bin is in place and the concrete has cured, the bin is securely held in position. A choice of smoking options is available for the Barnsley bin. 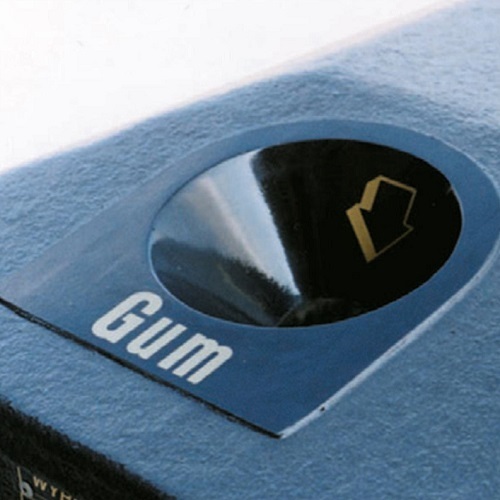 A stainless steel stubber plate can be added for stubbing out cigarettes and preventing unsightly marks on the bin. The stubber plate can be specified with either of the ashtray options. 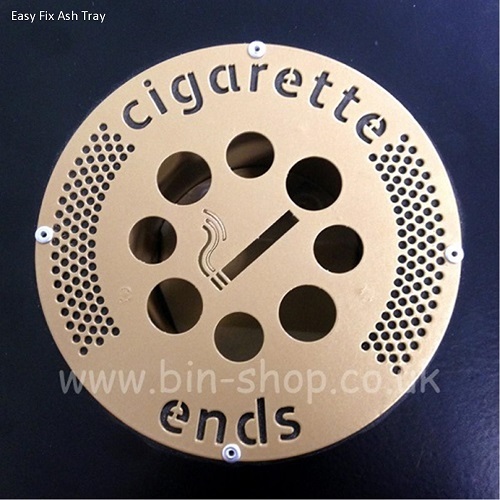 The circular Easyfit ashtray top is factory fitted to your litter bin and features a spring loaded butterfly bottom for quick emptying into the liner below. The standard ashtray top is factory fitted and has a large capacity with recessed drop area for cigarette and cigar butts. 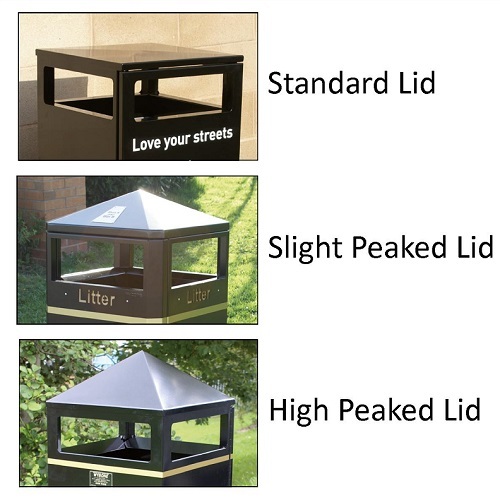 Three choices of lid are available for the Middlesbrough range of litter bins. The standard lid has a slightly kinked raised lid to allow rainwater to run off. The optional slightly peaked lid is 65mm high with the high peaked lid measuring 120mm high. Both of these lids have been designed with the aim of discouraging anti-social behaviour by not allowing people to sit on top of the bin or place rubbish on it.